So now Lily ‘Tiger Bread’ aged 3 and a half is making international headlines. Well, in the Netherlands apparently anyway. 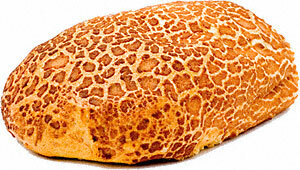 Where, according to some sources, Tiger Bread really originated. In case your Dutch is (singularly) rusty the article tells the story, equating £3 to 3.50 Euros. It hasn’t been spent yet: I’m hoping to think of something memorable to get within the price range. We seriously doubt we will meet Chris King in store, to thank him personally. Other blogs have also taken up the story. A Work in Progress, Christopher England, ReelGoneKid (a friend of Mr King’s), and Shiny Biscuit (a more sentimental view), Law Actually, Fishnip, and Understanding Alice all have links to threescore. So does reddit (advisory content warning), with some very funny comments from people unfamiliar with Tiger Bread, the pound sign or the idea of photographing a letter your daughter has not yet sent just because you think it is sweet. I have no connections with Sainsbury’s. It might just have easily been another store, had we lived near a different one. As a fan of close reading and analysis of texts, I am most intrigued by comments trying to unpick the letter or questioning Lily’s ability. She is a smart child. Today she said ‘it’s quarter past two mummy’ and it was. Maybe Sainsbury’s could get her the elusive Boden pink watch that I have not been able to. She knows her letters, her numbers to 100 and can read a few words already. She does this almost entirely of her own volition. She’s just naturally curious. I was actually keen that we only write the letter to Sainsbury’s if she wanted to, but she lit up and got super-excited when I suggested it. I told her the letters to press (phonetically), and when she typed a mistake she wanted to delete letters. I actually stopped her redoing Sainssssssssbbbbbbburyyys and c\alled because it was the original way she typed them. She laughed out loud at how she had typed Sainsbury’s. The c\alled repeat was because she remembered she had done it that way the first time and wanted to get it the same. This from a child who asks me why the word ‘one’ starts with an ‘o’ and not a ‘w’. She has a bright daddy. The pictures at the bottom of Lily’s letter are of a tiger (right) and her imaginary dog Beaky (right). She did not want to draw a giraffe. No problem. At that point she’d done enough so we wrote an envelope and found a stamp. I have saved some of the nicer comments about this whole episode to show Lily when she is older. But we won’t be writing more letters – it would be self-seeking and the whole reason we did it in the first place is because we both like making people happy. That’s a lovely reason to do anything, and I’m so glad Lily has been getting a lot of fans lately. I especially liked her drawing of a tiger. Thank you for not minding that I blogged about Lily (and Chris King, Sainsbury’s Customer Manager aged 27 1/3). Have an excellent rest of the week, especially the weekend part. Just seen these letters on Twitter (I know I’m a little late to the party!). When I was little, my mummy helped me write to the council about the rubbish bins, because I had asked her why they were always overflowing and she couldn’t answer me. The council sent two of their staff to go with me to see the overflowing bins I’d written to them about and I’ve never forgotten that day – being taken seriously by adults in suits was phenomenally exciting for a 6 year old. I think Lily’s letter is fantastic, and I wish more parents supported their children’s natural curiosity in the way you have. I saw your daughter’s letter and response on facebook today and thought it was lovely. It’s great that she wrote in. I remember being like that when I was her age. your daughter’s letter certainly hit international! I’m from Malaysia and I just saw the post earlier this morning. Maybe I’m just a tad late than the others, but hey, just to let you know, the letter made my day! Thanks Lily!